Need a volunteer? 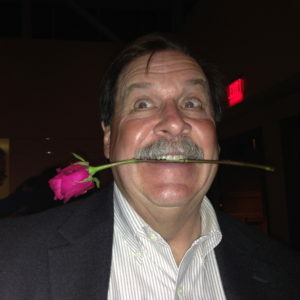 Ask Tom Driscoll. Need a leader for a field trip? Ask Tom Driscoll. Need some bird houses? Ask Tom Driscoll. Need someone to give a talk? Ask Tom Driscoll. Got some other project? Ask Tom Driscoll. Tom is a man with a modest mission. Do good things for the Earth and for all the people who live there. He has an unquenchable thirst for helping others. All others. No restrictions on ethnicity, gender, age, or taxonomy. Taxonomy? That’s right. If you are an endangered animal or a plant in a stressed environment or a forest under threat of clear-cutting or an ocean being polluted or air filled with pollutants, Tom wants to help. 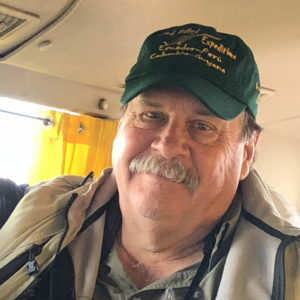 One way that Tom has put his magnanimity into practice has been his role as a New Hope Audubon Society (NHAS) board member for almost two decades. He has recently resigned from our board, but has promised to continue leading bird walks, giving talks, and helping with many of our other projects. 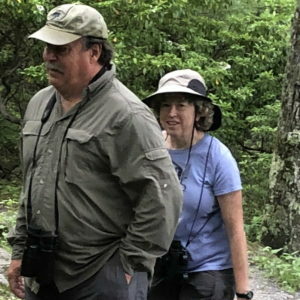 Tom joined the New Hope Audubon Society right after moving to North Carolina in 1997 to work at the Environmental Protection Agency, where he wrote regulations and policy for air pollution control and monitoring. He has been a member of the NHAS Board since 2001, serving as President for 4 years. He has been the chair of the program committee, the field trips committee, the Adopt-a-Highway committee, the publicity committee, the Wildathon committee, and the bird seed sale committee. 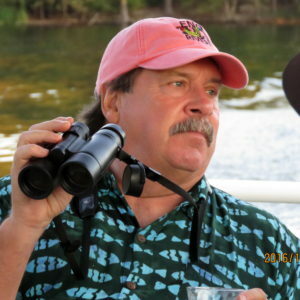 In short, Tom has helped guide New Hope Audubon in just about every way imaginable. But Tom is far from just a guide. He gets his hands dirty, gets sweat on his brow, gives talks until he’s hoarse, puts up bird houses, hauls bird seed, and more. Here’s a sampling: He helped build the Jordan Lake Wildlife Viewing Platform (and helped write the memorandum of understanding with the various stakeholders). He helped build the Mason Farm boardwalk. He pounded nails in the construction of the bird blind at the NC Botanical Garden. When NHAS has taken part in community events and festivals (Eno River, Festifall, and Chapel Hill and Hillsborough Garden Tours, for example), Tom has always put in more than his share of time running our booth. Trail-building and maintenance? Tom can handle clippers and loppers with the pros. He has guided six Eagle Scouts through their projects—building benches, laying out trails, and putting in erosion control features. For fundraising, NHAS has sold bluebird and nuthatch bird houses for many years. Tom has burned his hands with the branding iron with our logo as often as the rest of us. Luckily, he has not fallen off any ladders while putting up those bird houses for people who couldn’t do it themselves. All the volunteering mentioned above was with New Hope Audubon. One would think that was enough. But for Tom? No. He was on the board of the Eno River Association for 10 years. He has worked with the Interfaith Council, collecting groceries for the local food pantry. He has helped Christmas House gather and distribute presents for needy families. He has worked at the men’s shelter in Chapel Hill. 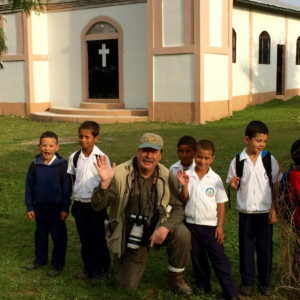 He has been part of a medical mission in Honduras twice, serving hundreds of people from remote villages who have no access to running water or electricity. And with his friends Jane Hathaway and others, he has been collecting and distributing used furniture to more than 800 families. Tom has also given talks to school groups (perhaps 50 times), talks at retirement communities (10-15 times), presentations about the NHAS Bird Friendly Habitat Certification Program 15 times), and he has led bird walks more times than one can count. Tom is the first to say that he has not done all these things without help and support from friends and family. He points out that his wife, Barbara, has been both an inspiration and a partner in all that he has done. She has been one of the prime movers in the Bird Friendly Habitat Program. She has been a president of the Eno River Association. She is a strong proponent of any activity that will benefit nature and the environment. She also worked for many years at EPA. Now retired, she is devoting much of her spare time to photography and bird watching. She recently won one of the top prizes in the National Audubon Magazine photography contest. No mean feat, when you consider the competition. Barbara is no ‘also-ran’ in this family. 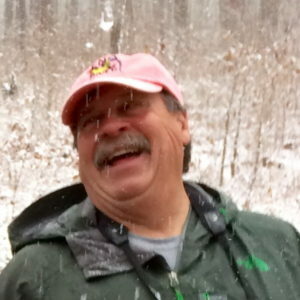 In his ‘spare time,’ Tom feeds his passion for birding. He has traveled to more than 20 countries, all over the world, in his desire to see as many birds as he can. His current list is 764 species in the US and Canada and 4,560 species around the world. That latter number is more than 45% of all the bird species in the world! Here’s a list of some of those countries. It’s just fun to consider all these places: Australia, Belize, Bhutan, Brazil, Chile, Costa Rica, Ecuador, Guatemala, Honduras, Indonesia, Madagascar, Mexico, the Netherlands, New Zealand, Panama, Peru, Singapore, South Africa, Spain, Thailand, Uganda, and the United Kingdom. It’s true that all that traveling is fun, but it also informs Tom’s understanding of the people and the environment around the world. It gives him perspective on what we need to do to help people and to make our world a better, more livable place to dwell. Kudos to Tom! A shining light for all of us to emulate.